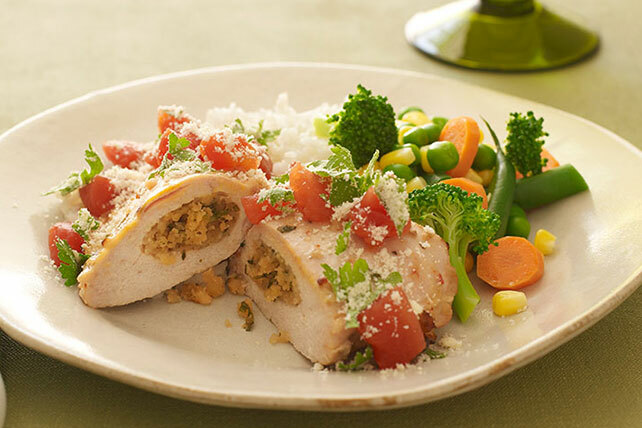 There's more to these stuffed chicken breasts than cilantro—namely garlic, diced tomatoes, grated Parmesan and crushed RITZ Crackers. Make 3-inch-long cut in one long side of each chicken breast to form pocket, being careful to not cut all the way though to opposite side of chicken. Place chicken in bowl; drizzle with 1/4 cup dressing. Refrigerate 30 min. to marinate. Heat oven to 375°F. Combine cracker crumbs, 1/4 cup cilantro, garlic and remaining dressing. Remove chicken from marinade; discard marinade. Spoon about 3 Tbsp. crumb mixture into pocket in each chicken breast; place on foil-covered baking sheet sprayed with cooking spray. Bake 25 min. or until chicken is done (165ºF). About 5 min. before chicken is done, cook tomatoes just until warmed. Combine cheese and remaining cilantro. Top chicken with tomatoes; sprinkle with cheese mixture. Substitute chopped parsley or basil for the cilantro. Substitute 1-1/2 cups TACO BELL® Thick & Chunky Salsa for the tomatoes.